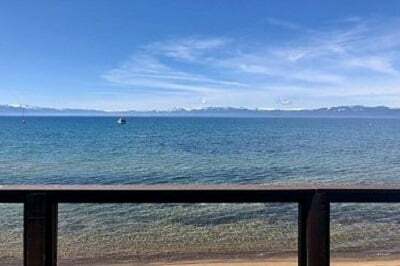 Lakefront - Short walk to Restaurant and shopsThe Kings Beach Lakefront Lodge is the essence of the perfect Tahoe vacation rental property, with an unobstructed lake view. Located in the heart of Kings Beach, you are close to every convenience that town has to offer. Directly out the front door, you are met with the welcoming sands of Lake Tahoe’s pristine shores. In the winter or summer, the home is only a short drive to the family-friendly Northstar Resort. Regardless of the season, the location and comfort of this home is a great family vacation or a getaway with friends. The Kings Beach Lakefront Lodge is the essence of the perfect Tahoe vacation rental property, with an unobstructed lake view. Located in the heart of Kings Beach, you are close to every convenience that town has to offer. Directly out the front door, you are met with the welcoming sands of Lake Tahoe's pristine shores. In the winter or summer, the home is only a short drive to the family-friendly Northstar Resort. Regardless of the season, the location and comfort of this home is a great family vacation or a getaway with friends. The second level of this property is set up to enjoy the spacious living space while enjoying the beauty of Lake Tahoe. The oversized glass sliders lead out to the extended living space that is a large deck. The living room is comfortably furnished and uses the wood burning stove as a focal point for an authentic Tahoe feel. The exposed beams and open ceiling add to the spacious feeling of the living area. This open concept living allows for a beautiful view from the seating area or from the amply fashioned dining area. The kitchen also takes advantage of the sweeping lake views. Whether you are cooking an intimate dinner with friends or using the outside area to BBQ, the home is perfect to enjoy the beauty of Tahoe. One of the bedrooms is located in the upstairs area of the home. Located off of the main living space, you will find a comfortable bedroom located on the back end of the house to provide a private area to relax. Also located off of the main living area is a full bathroom. The downstairs of the home provides the space for the majority of the bedrooms and the laundry. One bedroom is located on the back side of the house and has a separate sliding door entrance with quaint patio space. The other two bedrooms are located at the front house and take advantage of the lakefront view and access. The bottom floor is also equipped with an outdoor partial wrap around deck. One of the front bedrooms allows for access to the deck. The deck is only a few steps to the beach and would be perfect for enjoying your morning coffee or an afternoon libation. The physical makeup of the house allows for enough separation and privacy for everyone, yet has a living space that is perfect for congregating and enjoying the company of your party and not have to even leave the home to take advantage of beautiful Lake Tahoe. The outdoor area of this home has a small yard, but the front of the home is literally on the beach of Tahoe's shores. It is a great place to play in the sand, play some horseshoes, or just relax in the fresh Tahoe air and still be able to enjoy the convenience of being at home. The location to Kings Beach can't be beaten. Being at the end of a side street allows for enough privacy and is far enough off the main road to avoid the bustle of town. However, the property is still in close distance to the restaurants, grocery stores, and nightlife. The home is also only a quick drive to the North Lake Tahoe casinos and music venues. Also, a short distance away is the Northstar Resort, which allows easy access to the renowned Tahoe terrain in winter or golfing and mountain biking in the warmer seasons. Northstar Village also provides a plethora of other activities such as ice skating, movies, dining, spas, and bars. No matter what type of trip you are looking for this property offers the location and comfort to enjoy everything Tahoe. Although 80% of our properties are pet-friendly - this is NOT a pet-friendly property. Please be respectful of this. We do not consider service animals pets. If you bring a dog, you will be subject to a fine and are in breach of contract which could result in being asked to leave the property. Additional Fees include cleaning fee, administration fee, and local Transient Occupancy Tax. Check out time is 10 AM. I was a bt weary that it was in kings beach as I heard that was a crazy town however this cute little waterfront cabin was right on its own private beach with the most amazing lake view. We were two families with 4 kids between 9 and 17. They loved it too. Roomy, clean, well laid out and again so peaceful. Labor day weekend was crazy in kings beach but we didn't feel it as we never got in our cars. From the house you can walk to mini golf, safeway, rite aid, all beach activities, all restaurants and stores. We spent the weekend laying on the each and playing in the lake. Perfect stay and cant wait to stay again. This was a PERFECT spot. It is right on the lake with its own private beach, and it's gorgeous! ★ ★ ★ ★ ★We loved our stay in this Kings Beach lakefront cabin. The water is so close that we fell asleep listening to the waves - it was so nice! The kitchen/living room/dining room setup is perfect - we could enjoy the gorgeous view as much as possible. The only thing I would say to improve is that the lighting situation is a little dim, especially in the kitchen. Lounge chairs for the deck or beach would also be appreciated. Overall, we loved it, and would definitely come back! We just returned from our stay in King's Beach and had a wonderful time. The house was cozy, well-appointed, and in one of the best possible locations to enjoy King's Beach. Look out the window and you're treated to a million-dollar view of the lake and mountains. Step off the deck and your feet are in sand. Amazing. One of the toilets experienced an issue during our stay and Tahoe Moon Properties had a plumber out right away who replaced the part in no time. We'll definitely be returning to this home in the future. If I had to offer one suggestion, it would be for more (or at least more-effective) light fixtures in the living room. At night it was difficult to read unless one was directly next to the sofa-side lamp. Overall, we had an awesome stay! Highly recommended. © Tahoe Moon Properties. All Rights Reserved 2019. USA BRE # 00561304 . Vacation Rental Website & Marketing Design by Q4Launch.com.